Following last weeks media frenzy around the party train that is the LIRR from Manhattan to the Hamptons, one would expect the train company to make some changes. Other than mentioning that they will include one more party train to their fleet out East, no other changes have been made. Regardless, the train company is aiming to improve their image, and shed their drinking and partying ways. We received this little tip in our inbox from an MTA rep who admitted that "clearly, from the New York Times account of a train trip to the Hamptons, the Long Island Rail Road has some issues to address." Although unfortunately like your hot mess friend that drunkenly passes out in public on a regular basis, you can't quite send a train to rehab. Rather, the MTA plans on highlighting the good features of the East-bound trains like the "Hamptons Reserve Service which offers reserved seating on The Cannonball, our premier express train to the Hamptons." The rep goes to explain "I assure you, on The Cannonball, the atmosphere is somewhat more reserved." Reserved? Yes. Inconvenient? Absolutely. The Cannonball is a train that leaves Manhattan early on Friday afternoons, stopping only East of Westhampton. That's it. The services does not comprise of anything else, no west-bound services, no other times. Clearly this train is no StndAIR seaplane. And while the LIRR tries to improve its reputation, riders are continuing to treat the train as their own personal frat party. Recent stories have included women in full on ball gowns getting plastered on the train, while others have justified their behavior by saying they would be the same amount of drinking if they were traveling out east via car. Let's just hope they wouldn't be driving. My personal favorite use of the train comes to us through a little video. And yes, these drunken fools have created a Slip-N-Slide out of beer and the center aisle of the train. I guess you can only applaud their creativity with this gem of a sport. "I Voted Sticker" = Free Z-Burger! 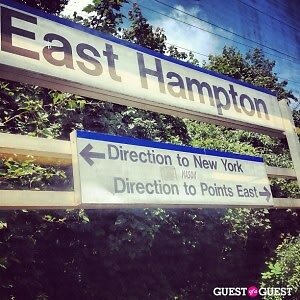 Home From The Hamptons: A Beer Slip-N-Slide On The L.I.R.R.